Considered one of the last true pieces of exploitation cinema before home video took over much of the market, Basket Case was Frank Henenlotter’s pet project turned full-blown success story. The horror gem about two brothers, one a normal looking man and the other a killer mutant in a basket, who travel to New York City looking for revenge against the doctors who surgically separated them against their will, made waves when it was released to theaters in its uncut form after its distributor attempted to excise the gore. Shot for very little money, it put Henenlotter’s name on the map and allowed him to go on and make more off the wall horror films like Brain Damage, Frankenhooker, Bad Biology, and no less than two Basket Case sequels. This trashy classic was an early staple of many home viewing splatterfests throughout the 1980s. Heralded by Joe Bob Briggs as one of the best horror movies ever made, it actually has more going for it than what’s on the surface. As the director himself admits, the idea of a guy carrying around his brother in a basket was a crazy idea from the start, and he had no intention of anyone ever actually seeing the film in such a wide capacity. Still, he was able to interject some humanity into it, even playing off of an odd brother-to-brother psychic connection. Basket Case is also a dark comedy of sorts. Without ever really going for overt laughs (or unintentional ones for that matter), the cast and crew basically went for it and hoped for the best, throwing in things like stop-motion animation, which even Henenlotter was initially skeptical about. On the other hand, some of the gore effects, including the doctor with the face full of scalpels, is still arresting and impressive all these years later. It’s also a perfect snapshot of a version of New York that doesn’t exist anymore. The gritty, grimy, and less than savory aspects of that area of the city, including the grindhouse theaters, the prostitutes, and the drug pushers, all have an old-fashioned charm that only aids the film’s low budget aesthetic. 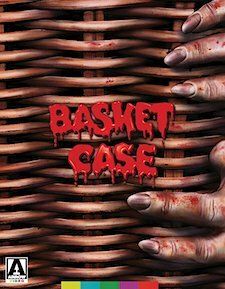 Despite its lack of financial backing, relying on intuition and resourcefulness to complete it, Basket Case proves that even a know-nothing filmmaker can pull off something special if the talent is there and utilized well. Basket Case has also been available on Blu-ray for a long time, and even though most of us assumed that it couldn’t look any better, we were completely wrong. Sporting a transfer taken from a brand new 4K restoration by the Museum of Modern Art (How cool is that?!) from the original 16mm AB camera negative with 35mm interpositive inserts and final approval by Frank Henenlotter himself, the film now looks better than ever. While there’s nothing that really can be done about the film’s technical limitations, depth and detail are remarkably improved here. Grain occasionally spikes during those aforementioned inserts, which are basically blow-ups that only make the grain more prevalent, but it’s well-resolved elsewhere. There’s an occasional bit of debris in the film gate which hasn’t been corrected either, but otherwise, it’s incredibly clean and clear without any heavy digital enhancements. The color palette is also much richer, which was never all that hot to begin with, including the beiges, greens, and reds of early 1980s New York apartment buildings and clothing. Even daytime sequences are improved with better brightness and contrast levels. Blacks are nice and solid, but never appear overly inky. Frame stability is also never an issue. It’s a marvelous presentation that retains the filmic quality of the original elements but presents them in the cleanest way possible. The sole audio option is an English mono LPCM track with optional subtitles in English SDH. It too has been repaired to the best of MoMA’s abilities, but with obvious limitations. The cue during the opening credits, for example, doesn’t sound much better than it did in previous home video editions. That said, this is a fine track without any hiss-related issues, nor is there any leftover crackle. Some light distortions, which are built-in to the track, pop up occasional, but no dropouts are present. The on-set dialogue and occasional overdubs are clear and recognizable from one another, but sound effects, including noises from Belial, have much more fidelity to them and are the most effective aspect of the track as a whole. The score comes through well enough and everything is fairly well-balanced. Arrow Video’s release also carries over nearly all of the extras from previous releases, but also updates them and adds a ton more. There are two audio commentaries, one with Frank Henenlotter and Kevin Van Hentenryck, and the other with Henenlotter, producer Edgar Ievins, actress Beverly Bonner, and filmmaker Scooter McRae; Basket Case 3-1/2, a faux interview with Duane Bradley by Henenlotter himself; Me and the Bradley Boys: Kevin Van Hentenryck on Basket Case, a new interview with the actor discussing his experiences on the film; A Brief Interview with Director Frank Henenlotter (another bit of fun); Seeing Double: The Basket Case Twins, an interview with Florence Schultz and Maryellen Schultz, who play the two nurses in the film; Blood, Basket and Beyond with Beverly Bonner, a new interview with the actress/performer; The Latvian Connection, a new featurette containing interviews with producer Edgar Ievins, casting person/actress Ilze Balodis, associate producer/special effects artist Ugis Nigals, and Belial performer Kika Nigals; and Belial Goes to the Drive-In with film critic Joe Bob Briggs and producer Edgar Ievins, discussing the Briggs’ uncut presentation of the film. And that’s not all! Also included is Basket Case at MoMA, a Q&A from the 2017 restoration film premiere at the Museum of Modern Art with Henenlotter, Hentenryck, Bonner, Maryellen Schultz, Florence Schultz, and Ugis Nigals; What’s in the Basket?, a feature-length documentary on the entire series (from the memorable Second Sight Films release of the film); In Search of the Hotel Broslin, a 2001 featurette with Henenlotter and rapper R.A. “The Rugged Man” Thornburn; a six-minute outtakes reel in HD from a 2K scan of a 16mm print; The Frisson of Fission: Basket Case, Conjoined Twins, and “Freaks” in Cinema, a new video essay by Travis Crawford discussing the history of films featuring “freaks of nature”; a set of image galleries (promotional stills, behind the scenes, ephemera, advertisements, home video releases); a promo gallery featuring 3 theatrical trailers (all in HD from 4K sources), a TV spot (also in HD from a 4K source), and 2 radio spots; The Slash of the Knife, a rarely seen short film made by Henenlotter prior to Basket Case; an audio commentary on The Slash of the Knife by Henenlotter and Mike Bencivenga; outtakes and an image gallery from The Slash of the Knife; Belial’s Dream, an animated short story by filmmaker Robert Morgan; and last but not least, a 28-page insert booklet featuring the essay “Case History” by Michael Gingold, “Cham-pain in the Park!”: a Basket Case comic strip by Martin Trafford, and restoration details. This release also comes with a limited slipcover. With this multitude of bonus material, it’s hard to believe that there’s anything leftover, but there is. Missing from the Something Weird Video/Image Entertainment DVD and Blu-ray releases is an introduction by Frank Henenlotter; two radio interviews with actress Terri Susan Smith; and clips form Beverly Bonner’s comedy cable TV show Beverly Bonner’s Laugh Track. Also missing from the CMV Laservision German Blu-ray release is the A Look Behind the SFX Scenes featurette and the film’s Spanish theatrical trailer. Space constraints likely kept some of this material from being included, so if you own any of these releases and want absolutely everything, you may want to hold onto them a bit longer. Arrow Video has taken a title that we all thought was fairly definitively represented on home video already and injected it with steroids. Basket Case looks fantastic now and with the bounty of extras in tow, it’s easily one of their most satisfying discs of the year. Highly recommended to anyone who’s still curious about what’s in the basket.